Kotor old town is a very well preserved medieval city with a range of monuments and architectural beauty unmatched not only on the Adriatic coast, but internationally as well. This extraordinary city, located in the heart of Kotor bay, cleverly hidden underneath the mountain of Lovcen, has been included in the UNESCO world heritage list since 1979. You will be led by local licensed tour guide who will be eager to introduce to you the history of Kotor as well as the history and heritage of Montenegro. Kotor old town is a very well preserved medieval city with a range of monuments and architectural beauty unmatched not only on the Adriatic coast, but internationally as well. This extraordinary city, located in the heart of Kotor bay, cleverly hidden underneath the mountain of Lovcen, has been included in the UNESCO world heritage list since 1979. 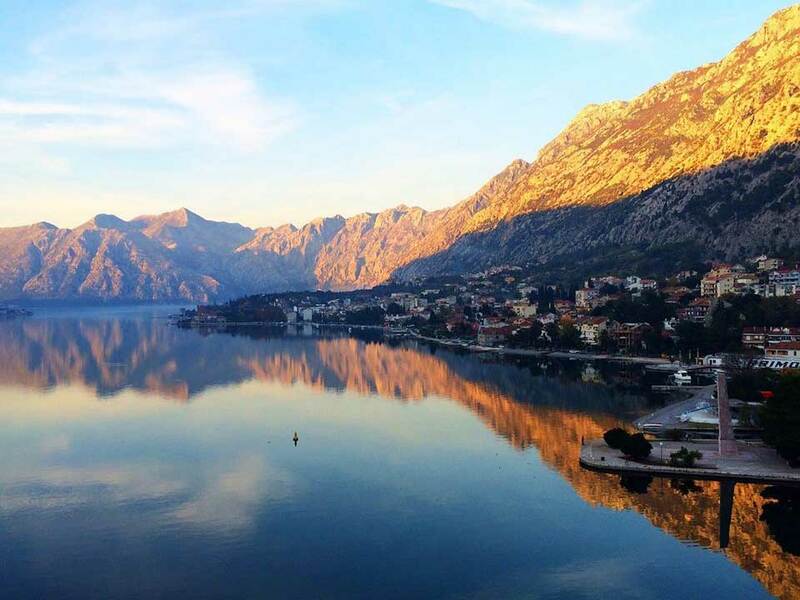 Kotor lies at the foot of St. John’s hill, within triangle bordering the sea and two rivers, the Gurdić River in the south and the Škurda river in the north. There is San Giovanni fortress on top of St. John’s hill. It is possible to walk all the way up to the top peak as there are 1350 steps that lead to San Giovanni so if you are in the mood for some hiking I suggest to do that later in your free time as it a great adventure and from above you have a beautiful view over the Bay of Boka, officially one of the 25 most beautiful bays in the whole world. I am saying „officially. as it is not only the opinion of the Montenegrins but also of the UNESCO which has enlisted this bay among the 25 most beautiful ones and the rest 24 are mostly situated in Scandinavia, Alaska and Japan so Boka is the only one amongst these 25 at the Mediterranean which makes it special. 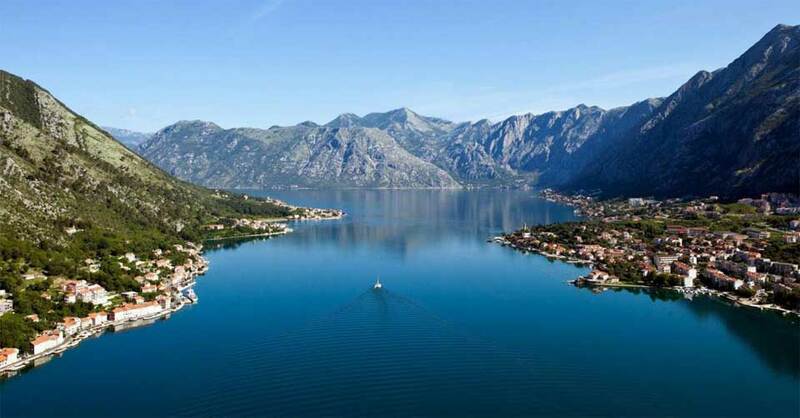 The name comes from the Italian words Boca di Cattaro which means “The mouth of Kotor”. 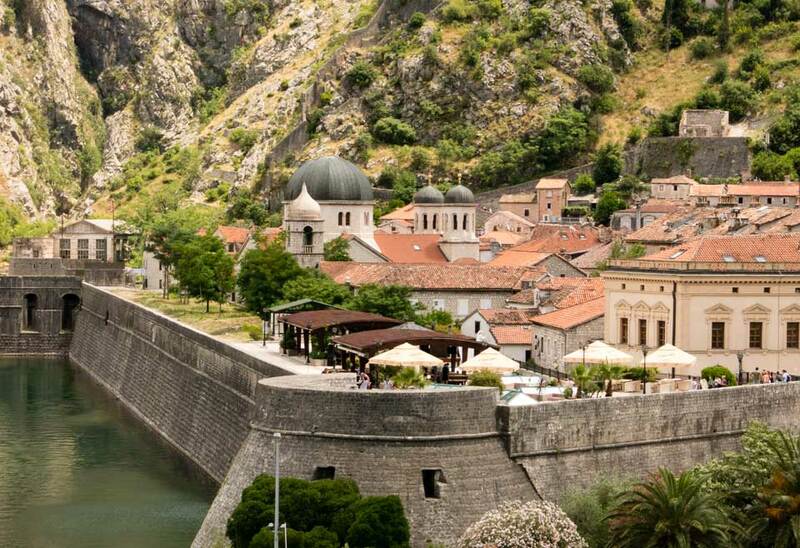 Kotor is one of the few towns in the Mediterranean that has preserved its system of fortification which is 4.5 km long. The walls are 2 to 15 m thick and in some places they are up to 20 m high. Kotor’s system of fortification developed starting from the Illyrian hill fort on St. John until it obtained today’s appearance in the 18th century. The town is entered through three gates. The northern gate, with a drawbridge across the Škurda was erected in 1540 to celebrate the defense of the town from the fleet of the Turkish pirate Barbarossa. His fleet reached the place where the city gate was later built. The southern gate had a wooden drawbridge across the Gurdić from the 18the century. Square of Arms is the first square after the passing through the Town Gate. It is from 16th century and it is the most spacious square in the town. Prince’s Palace takes up almost the whole western side of the square. It was built in 1763 and it was used for various military purposes. In it basement there was a place for prisoners and storages, on the first floor there were dormitories for soldiers and lower officers while the first floor was used by higher officers. This palace has a modest architecture and the only thing which stands out is 55m long balcony. The Old Town Hall from the moment of its construction, in 1762, up to the beginning of the 20th century had been a military building intended for food storage. After the French occupation it will be altered into the theatre building in 1810. Because of that this building is known as the French Theatre or the Napoleon’s theatre. In 1904 the town authorities will restore it and alter it in the classicist style according to the design of the town architect Milan Karlovac. The Town Clock Tower occupies the central site on Square of arms. Its construction began in 1602. Up to the French occupation it had one clock face but the French made another, the southern one. In front of the clock tower there is a mediaeval pillory in front of which verdicts used to be read and prisoners used to be brought. Today’s pyramid is a reconstruction because the original one was broken in 1945. Bizanti family palace dates back in the 14th century but after the great earthquake in 1667 it changed its original look. The palace has Renaissance expression. The windows and the family coat of arms were done in Baroque style. The palace was restored after the earthquake in 1979. Beskuća Palace was built in the second half of the 18th century. It was constructed on the site of some other buildings which probably belonged to Bizanti family. The palace is of simple form without rich decorative elements The most important element of the house is the Gothic portal which was incorporated into this place from some houses of Bizanti family. Square of Flour got its name after flour storages which used to be there. 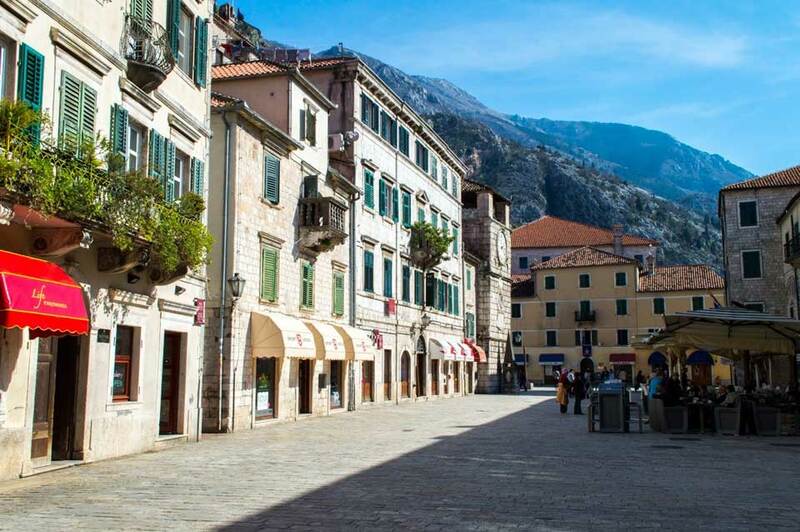 This beautiful little square is very important in the cultural history of Kotor. There are palaces of two noble families of Buća and Pima and Old Gymnasium. Pima noble family gave Kotor manz famous persons. One of them was a crowned poet and the other one was the doctor of law and pro-rector of Padua University. Pima Palace was built after the eartquake in 1667. Its architecture shows the elements of Renaissance and baroque style. The Renaissance elements are the vaulted loggia, the entrance portal and the terrace. St. Tryphon’s Square is the main Kotor square. The citizens of Koto used to gather on this square during centuries when important decisions were being made. There are a couple of main institutions on this square: St. Tryphon’s cathedral, Town Hall, Kotor Historical Archives, Drago Palace. St. Tryphon’s Cathedral Andrea Saracenis, bought the relics and instead of St. George who was a protector of the town, St. Tryphon became the new protector. The relics were placed inside of a smaller church that existed at this place. Because of this and also the need for bigger church, the citizens of Kotor started the construction of the new St. Tryphon’s Cathedral in 1124. The works will last until 1166. The cathedral from 1166 was built in Romanesque style with the elements of Byzantine architecture. The present cathedral went through major changes because of the effects of catastrophic earthquakes (1537, 1563, 1667, and 1979). On the western façade of the cathedral there are two bell-towers and terrace under which there is the main portal of the Cathedral. The original bell-towers from 1166 were completely destroyed after the earthquake in 1667 together with the western façade. This earthquake is known as the Great Shaking or Great Dubrovnik earthquake which apart from Kotor badly damaged Dubrovnik. It damaged the bell-towers which were rebuilt at the end of the 17th century. Museum Square is one of the smallest squares in Kotor. The north side of the square is dominated by Gregorina palace. St. Lucas’s church was built in 1195 at the time of King’s Nemanja rule. The church is built on the model of similar churches in medieval Serbia. Later to this church was added the chapel of St. Spiridon to the northern wall .This church is a mixture of Romanesque and Byzantine architecture, but the bell tower from the 18th century is done in Baroque style. The church was fresco painted soon after the construction. 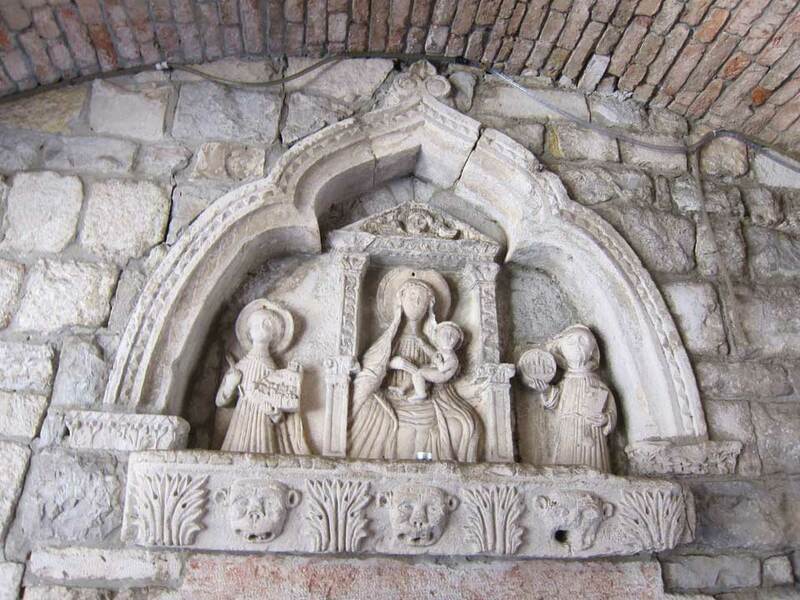 Only one fragment of it was preserved on the southern wall of the church. It represents a saint and two female saints. St. Nicholas’s church was built on the site where there used to be the Dominican monastery of St. Nicholas built in 1540. The church is designed in pseudo-Byzantine style. Two bell towers frame the main façade. The iconostasis in the church is the work of Czech painter in the Classicist style. The tour starts in front of the old town main gate with a short story about the town and the country. 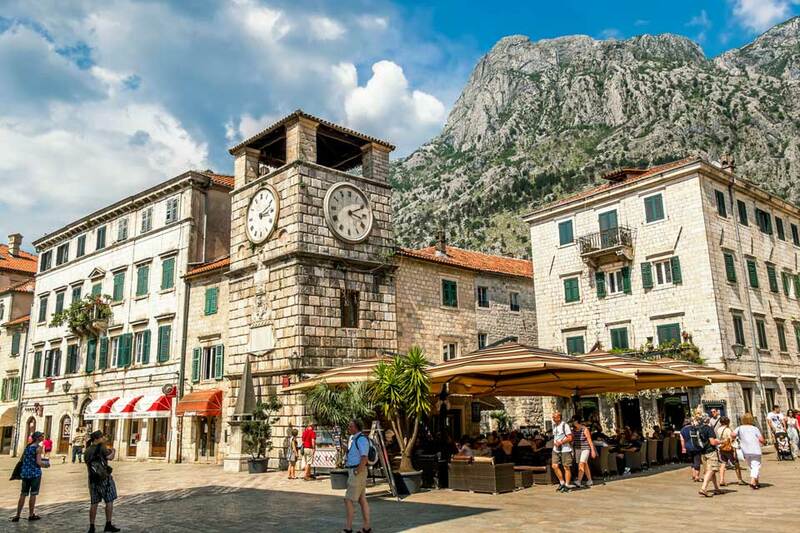 Kotor walking tour will certainly not leave you indifferent as you will get the opportunity to understand the Montenegrin traditions, heritage and culture. How can I join this tour: You can book online or show up at the meeting point 10 minutes before the tour starts. Where the tour starts: The tour starts in front of the main gate of the old town of Kotor. The guide will be waiting for you in front of the old town next to the Tourist Information Centre, wearing our Kotour t-shirt. How can I book this tour: You can send a request or book directly online through a safe online payment system. The group limit is 12 people. 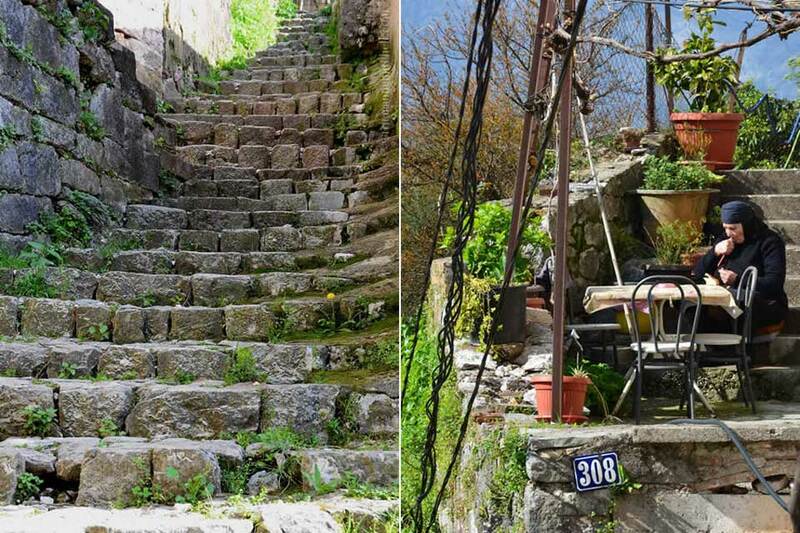 Included in the tour price: Kotor old town entrance fee, maps of the town.